It is with great pleasure to introduce you to sweet Divina Pe of Sense and Serendipity she is a wonderful cook and lovely person . She is from Manila,Philippines a professional cook, dancer, Violinist and an Aspiring food writer. Her blog is fabulous with healthy mouth watering recipes and great photography. This is my first guest post for 2010 and writing a post for Rebecca is wonderful and as I think of a recipe for her blog, I could imagine inviting Rebecca at my home for a quick yet relaxed lunch before she goes back to work (I work from home writing and taking care of Jasmine LOL). Just pretend that she’s in my neighborhood. And for her, I want something that would make her feel really at home and what could be better than Roasted Chicken and Brown Rice Soup. I could have prepared a fancier and more expensive meal but this soup is full of warmth, joy and comfort. Roasted chicken is not only for special occasions anymore. They are undeniably a quintessential part of everyday meal. I consider them to be a staple in every household. I’m sure you have your own recipe so I’m not posting another roasted chicken recipe. I may avoid the skins in almost every chicken dish, even fried chicken but with roasted chicken, I do eat the skin (only when newly roasted). They’re so full of flavor and they’re absolutely delicious. They are simple to make and they are truly versatile. If you have any leftover roasted chicken or other poultry, they are perfect for every kind of dish – soups, salads, pot pies, pasta, sandwiches and many others. Try to make roasted chicken every two months or even every month and see how many recipes you can come with it. You’ll be thankful that you have roasted chicken in the fridge to save the day. Sometimes you would roast a whole bird just because you want to incorporate it into other dishes. That’s what I did here. I did roast some chicken but not as a dish but because I want to use it for something else like this soup. I grew up with white rice my whole life and I still can’t live without it. But I also love the nuttiness and wholesomeness of brown rice, always soaking them first before cooking for full digestibility. 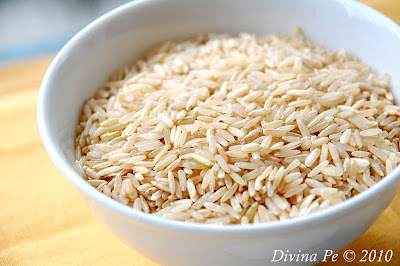 And you can also use a rice blend for a more interesting texture which also provides a good source of nutrients. Whatever you add to this chicken and rice soup would be good but I love the addition of umami-rich and earthy mushrooms. This is really comfort food elevated to ultimate gorgeousness. Serve this with an antioxidant salad and a light dessert and you’re good to go. I hope you like it. To cook the rice, drain, rinse and place the soaked rice in a large pot with the chickens stock. Add ½ tsp of salt and bring to boil, then lower the heat to simmer, cover and cook the rice for 45 minutes until the liquid has been absorbed. This can be prepared in advance. To prepare your mise en place, peel and cut the onion, carrots, celery and leeks into medium dice. Then, cut the bottom of the shimeji mushrooms and hand shred the roasted chicken. To cook the soup, melt butter and warm the olive oil in a large soup pot. Add the onion and season with salt. Sweat until the onions are soft and translucent. Add the carrot, celery and leeks and cook until the vegetables have softened, about 5 minutes. Stir in the turmeric and cook for another 1 minute. Add 6 cups of the chicken stock and bring to a simmer. Then add theshimeji mushrooms, the chicken and the rice. Cook until the mushrooms are cooked, and the rice and chicken are heated through. Check the soup if it needs more stock. Season to taste with salt and freshly ground black pepper. Remove from the heat. To serve the soup, remove the tarragon leaves from the stem and add to the soup. Ladle the soup into individual soup bowls and serve immediately. Another way to cook this soup is to bring the chicken stock to a boil. Add the rice and reduce the heat to simmer. While the rice is cooking, sweat the other ingredients (onion, carrot, celery, leeks and turmeric) in another pan. When the rice is already cooked, add all the ingredients and simmer until everything is heated through. Season to taste and serve. 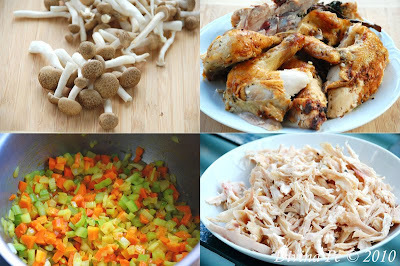 After removing the chicken from the bones, save the chicken bones to make chicken stock. This is so healthy and yummy. I cooked brown rice sometime but Divina Pe done a much better job than me. Thanks for sharing. Mmm another great soup recipe for our soup diet! yumm , I love soups like these, looks delicous! The rice soup looks awesome! I love it. I am so glad to find the time again to visit your blog and enjoy the pictures and the recipes! What a gorgeous soup! I need to try this next time I make roast chicken! Thank you so much Divina and Rebecca! what a wonderful looking soup! Is there anything more comforting than chicken soup? And this one is special. Divina's recipe has so many flavors going for it. Copying now. A healthy and delicious dish. My family would love this anytime...and many helpings :P As usual, great post by Divina. I admit that I don't do my own roasting - the chickens available at the grocery have served me well. In fact, I bought a huge one yesterday and used half for another dish. Now, I have this recipe for the rest! I love the use of turmeric - it gives the soup such a lovely color, a bit like sunshine. Thanks, Rebecca and Divina! what a great recipe and a wonderful and insightful piece - you can never go wrong with a roast chicken - and you can quote me on that. I could have that roasted chicken soup for breakfast,lunch and dinner. Just delicious with all those goodly ingredients. What a wonderful gues post Divina Pe. You are right, this would be a perfect lunch before returning back to work. This soup would be perfect anytime! 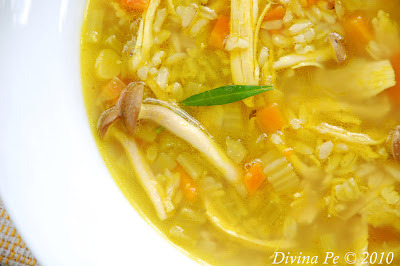 The roasted chicken soup and brown rice look absolutely delicious! Wow! Divina always makes such beautiful dishes :) I will definitely have to make this -- I just bought some tumeric and haven't had the chance to use this. Love your blog! This is healthy and nutritious. Divina did a good post. Another healthy yet delightful dish. Great post as usual. Hmmm... it's a rainy day here... maybe soup time! Pure warmth, joy & comfort. What a beautiful guest post from a beautiful person! Wonderful!! What a delicious and comforting soup! Food for the soul. Wonderful guest post, Divina! I love your use of the phrase "ultimate gorgeousness." I am going to have to borrow that! Beautiful soup. Sounds like a delicious soup to me! I would be so happy to sit down to a bowl of soup like this for lunch. So nourishing and comforting. Yum! Gorgeous pictures, it looks delicious! Thanks for the recipe! That is just warming to the soul! I love davina pe's blog. ive tried some wonderful recipes from her blog and they were such a hit! What a wonderful soup! This will go great with my renew engery to stay fit-- love this post. Thanks to you for inviting your guest to post. It looks great! Is this a Filipino dish? I've had similar chicken and rice dish when I visited my Filipino friend's house and I loved it. I like how you used brown rice and shimeji mushrooms! Well done, Divina! This looks sooo yummy. I love rice with soup ever since I was little and still loving now. It's a cold day here today in Pennsylvania and I could really go for a bowl of this soup right now. It looks wonderful! Great guest post Rebecca! Divina is wonderful. 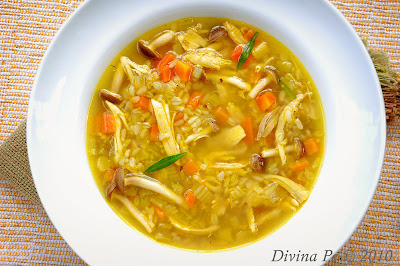 This roasted chicken and rice soup looks so nourishing and delicious! The colors are beautiful. Yummmmmmy...love chicken rice soup and I've not made it in at least a year!